In the summer of 2016, me and my team from Family Goes Out team visited Gialova Gardens in Gialova, Messinia. Gialova is a quaint village in the Navarino Bay in the municipality of Pylos-Nestor of Messenia in the Peloponnese. 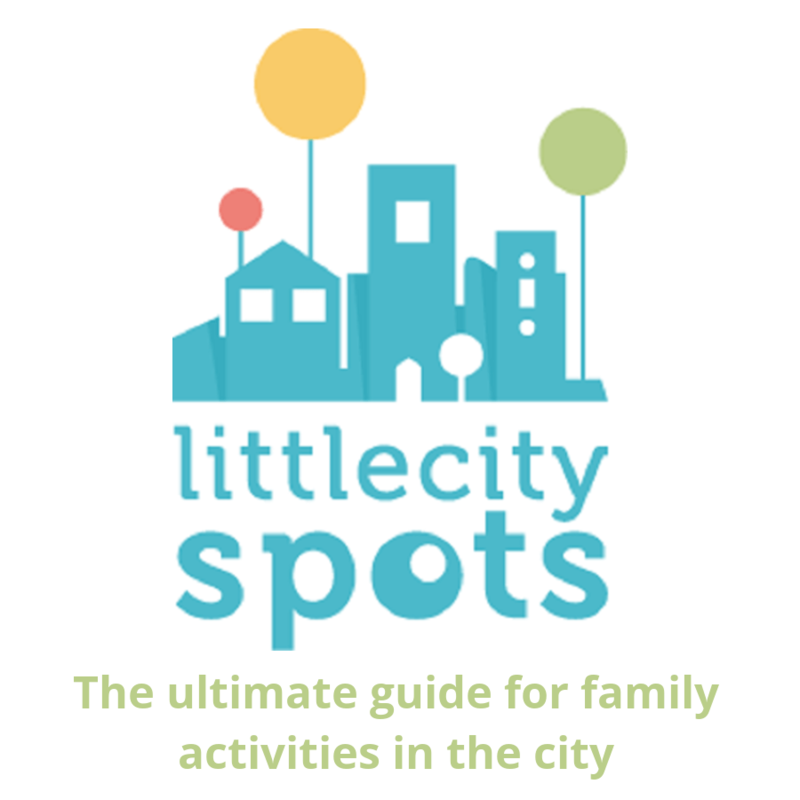 An area with an interesting history and many things to see and do for families. Gialova was first settled at the beginning of 1900. Raisin and wine exports led to this area’s commercial development. Witness the former agricultural industry in the two abandoned wine factories in Gialova and stone warehouses formerly used to store raisins, carob and lemons. Gialova’s population nowadays is about 300 people. 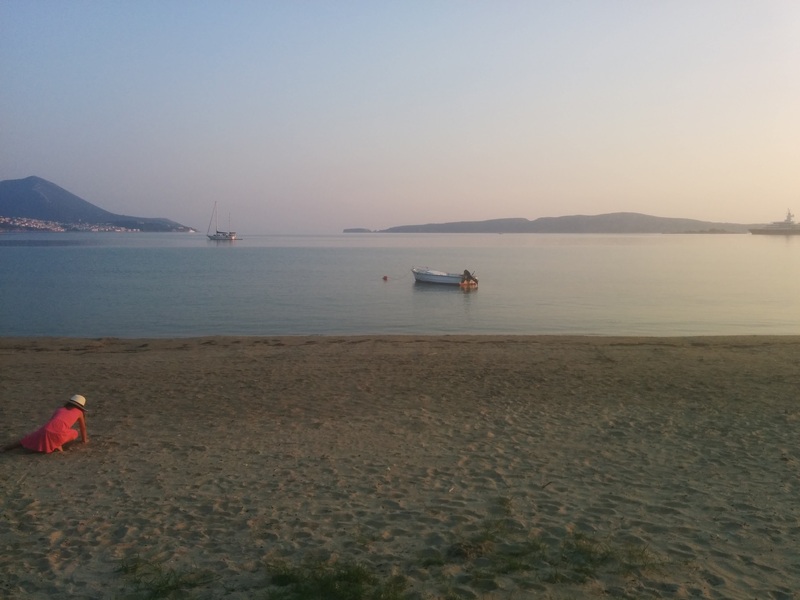 Gialova has two parts: the beach/port part of the village with a beautiful boulevard overlooking the bay and the town of Pylos. Here are some (wine) bars, restaurants, a few quality shops and a small hotel. Where the two streets meet there is a quay used by local fishing boats. The residential and commercial part of the village is 1 km further north along the Pylos-Kiparissia road. Gialova is small and everything is near. During a holiday in Gialova with kids you don’t need a car to get around. At night, the boulevard is a car-free zone. Gialova is most famous for its wetlands. These lagoon/wetlands are an important stopover point for many migratory birds as it constitutes the southernmost migratory station of birds in the Balkan and from Africa. Many rare species of birds such as herons and flamingos can be found here in their season. Other special animals are the African chameleon (the one that changes it’s color! ), many other species of reptiles, fish, mammals and the caretta caretta turtle. These wetlands are a protected area but you can visit some parts by bike. The observing station of the Ornithological Society at the lagoon enables your kids to learn about the area. The visitor center is open every day from June until October and with advanced notice during other months. We drove around the lagoon by car. 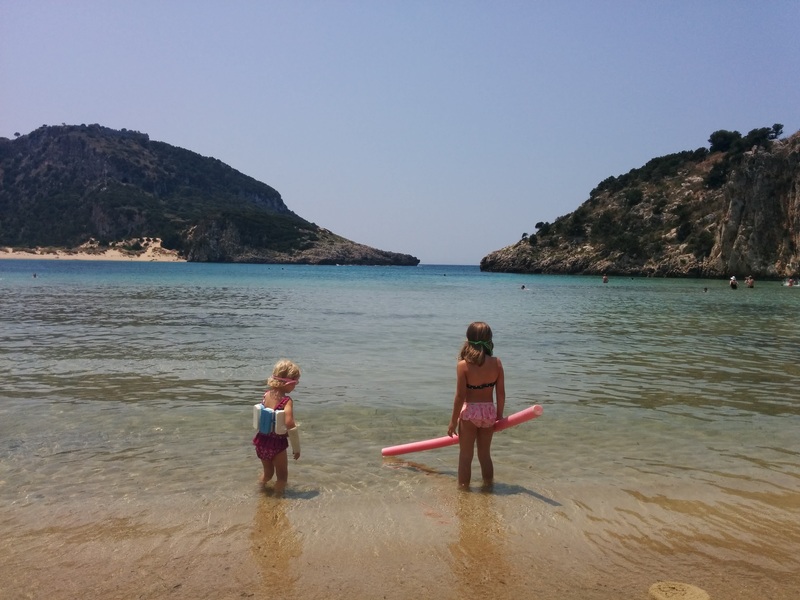 My children were looking much forward seeing the flamingo’s (as we did in Poros island) but we had not realized that we would not be able to find them in the summer here. We are planning to come back to Gialova during another time of the year because the area is a destination for other seasons too. We had a very interesting night at the museum of Gialova. The famous folklorist Mr. Kostas Balafoutis dedicated hours of explaining my children every artifact in his collection. He is THE expert on the region and if you have any question related to the history, the historic battle of Navarino (last battle with sail ships!) or anything that has to do with this part of Greece, Mr. Balafoutis is the man to ask. He has written two books about Greek folklore. The museum usually opens from 5pm. We saw here a collection of traditional farmer equipment, maps, wood from ships of the Navarino battle, clothes, children’s toys, weapons, archeological findings, fossils, musical instruments and so on. I could write a separate blog post just about the collection of Mr. Balafoutas museum. My kids learned how soap was made, what people used before electricity was invented, how people used to store their food and much more. Thank you for your time and amazing stories Mr. Balafoutis! 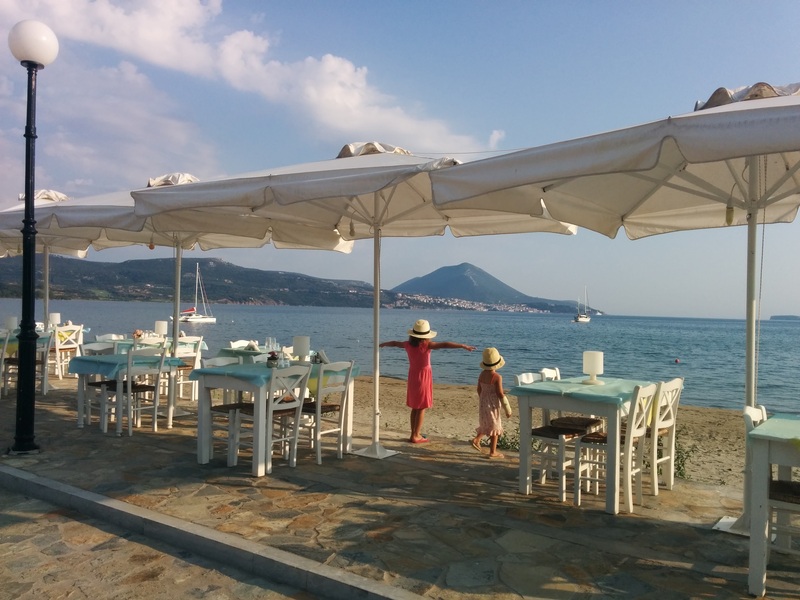 The first beach that we found – and maybe the best beach for young children – was the beach at the Zoe Hotel in Gialova next to the port. You can use the sunbeds and umbrellas for free. There is lots of shade under the trees, there are showers, swings in the shade, toys for the children to play with and a large lounge area. There is a restaurant as well but you can also order snacks on the beach. Next to the local Gialova beach at the Zoe hotel, there is a 1.5. km long sandy beach called ‘Golden Beach’ or ‘Divari Beach’ (Divari means hatchery in Greek). It starts at Gialova and continues west to Old Navarino castle. This is part of the aforementioned nature reserve area and the lagoon. The beach is actually a narrow bar separating the sea waters from the bay from the brackish waters of the lagoon. The most part has no facilities so you will need to bring an umbrella and food/drinks with you. You can also sit at the one beach bar on this beach. Here you can find showers/toilets, chairs, and umbrellas. 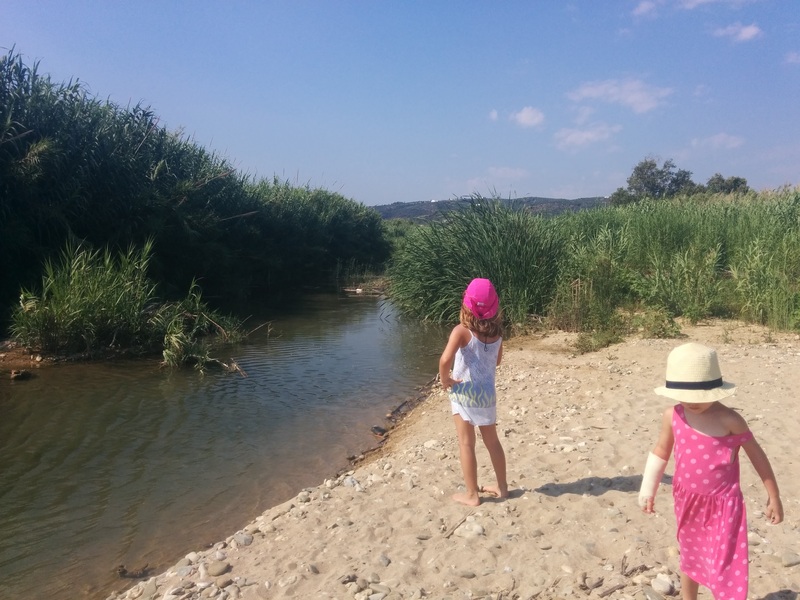 To the north of the Old Navarino castle (worth a visit with older children because of the hike) and between the wetland and the sea is the breathtaking beach of Voidokilia. A perfectly round beach surrounded by rolling sand dunes with thick thyme bushes. The sandy horseshoe bay of Voidokilia is considered one of the most famous beaches in Greece and the Mediterranean Sea. Voidokilia means ‘cow’s belly’ in Greek. This bay is actually referred to in Homer’s Odyssey and archaeologist believe it was used by King Nestor as a port in ancient times. The sand on the beach is fine, it is protected by the wind and hidden behind sand dunes. Voidokilia Bay has been recognized officially as a landscape of exceptional natural beauty by the Greek government. No other geological formation like it exists elsewhere. The area is considered of archaeological interest: therefore you will not find restaurants/bars or any other facilities here. You can easily get there by car and park near the beach. But you will need to bring an umbrella for shade and some food/drinks. Our children loved it here, it was like swimming in a large swimming pool in an amazing tropical setting. It’s also worth taking a walk through the dunes behind the beach. While I was taking photo’s there, I noticed many butterflies on the thyme bushes. Other family activities in and around Gialova are the (glass bottom) boat trips to the bay of Navarino, Sfaktiria island, and Voidokoilia. You can also rent a boat yourself or make a cruise. There is a diving center in nearby Pylos. The waterfalls of Kalamari – Schinolaka and the gorge and waterfalls of Polilimnio and Neda are also worth a visit. If you are interested in archeology and ancient history, this part of Greece will not disappoint you. You can visit Nestor’s Palace in Chora, Neokastro (Niokastro) or the Pylos Castle, the Pylos Museum, the Venetian Castle of Methoni and Ancient Messini. Also, the ruins of the ancient Old Frankish castle Paliokastro are nearby. These archaeological sites are open from Tuesday to Sunday 8:30 am to 3:00 pm. From Gialova you could also make a one day trip to Ancient Olympia or Kalamata. You can also visit the towns of Pylos, Methoni, and Koroni. There are daily public buses going to Pylos and Kalamata. Gialova is famous for it’s good and affordable restaurants and taverns and people from all nearby villages come to Gialova to eat fish or traditional Greek food. Most restaurants are open all year long. 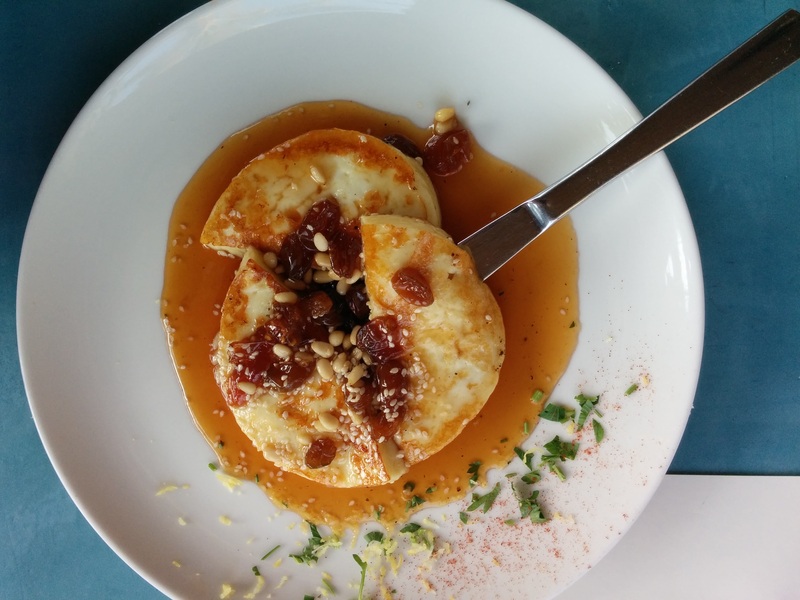 We tried three restaurants, each with their own characteristics. All of them were of excellent quality, very reasonably priced and family friendly with high chairs and child-friendly dishes. They are all three located on the car-free zone (after 7pm) on the boulevard. It was very nice that our children played on the beach or village square whilst we enjoyed our meals. Elia is a casual modern decorated restaurant with lovely mint green colors and wooden accents located on a corner of the boulevard overlooking the sea. Here our kids were free to play safely on the little square next to Elia (kids can even ride their bikes here), make drawings and use the toys provided by the restaurant. Elia was opened in 2008 by Zoe and Dimitris. They have an 8-year-old son. Elia serves Greek food made from local products from local suppliers and they make their own extra virgin olive oil. Elia also serves a wide selection of local wines on their menu and their own Elia red and white wine (Sauvignon Blanc and Cabernet Sauvignon Floka Messinias). 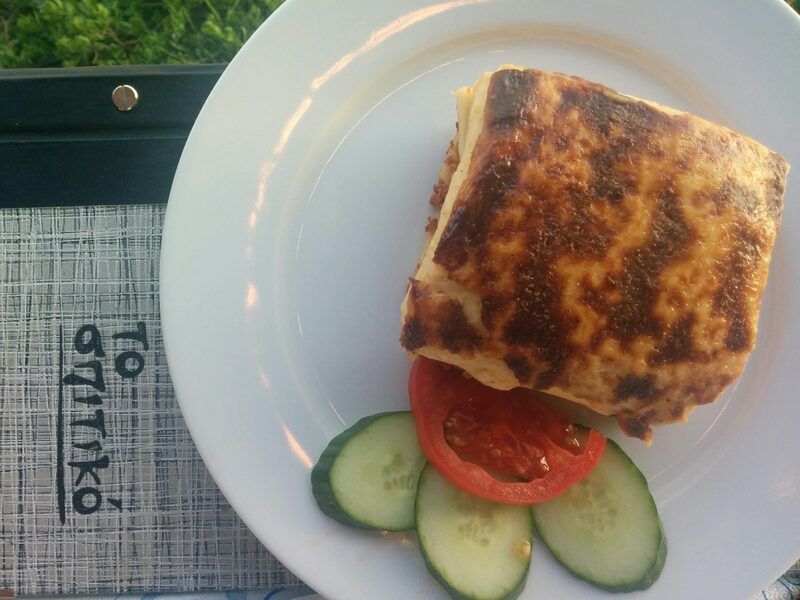 Besides the typical traditional Greek foods, Elia also serves plates that Greeks do not eat every day at home and local specialties. Examples are a rabbit with prunes, fennel pie, omelet with wild herbs, local cheeses, and fish. We tried fried Talagani with grape sauce and orzo with seafood. 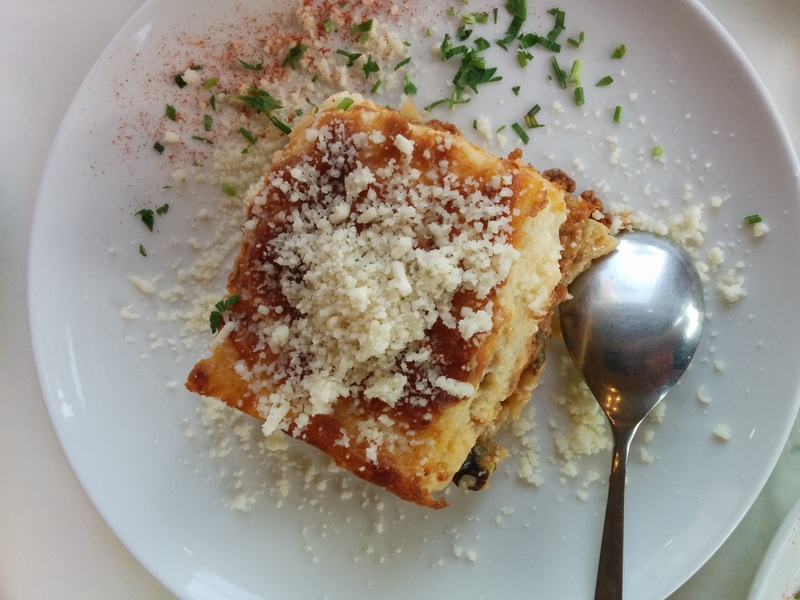 We had a special version of the famous Greek moussaka; the potatoes were replaced by pasta rigatoni to make it even more attractive for the children. The atmosphere was extremely relaxing and Zoe was our lovely company this evening fascinating us with her stories about the lagoon and the wetlands. Zoe’s tips for visiting Gialova is renting a bike and taking the family inside the lagoon. Further down the boulevard is taverna To Spitiko (free translated by ‘Home’ or ‘Homemade’). Here we sat on the seaside tables enjoying the sunset whilst were children were playing on the beach right in front of us. Very safe and very family friendly! We started our meal with a drink refreshing drink with mastiha liqueur, a little ginger, lemonade, and orange. To Spitiko is a family business passing from one generation on to the other and feels like being at home. The fireplace and the warm traditional decorations inside made us feel we were visiting a relative. 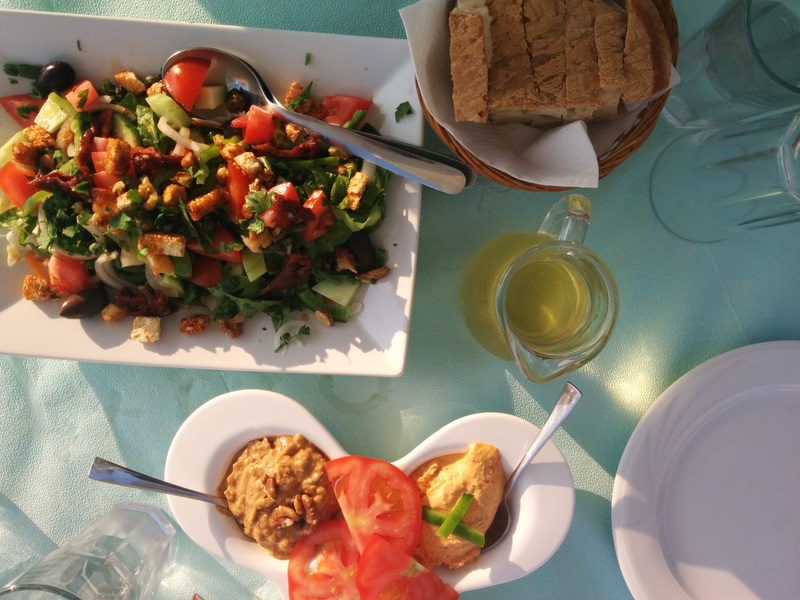 The food served in To Spitiko are traditional Greek and Cypriot dishes and fresh fish. 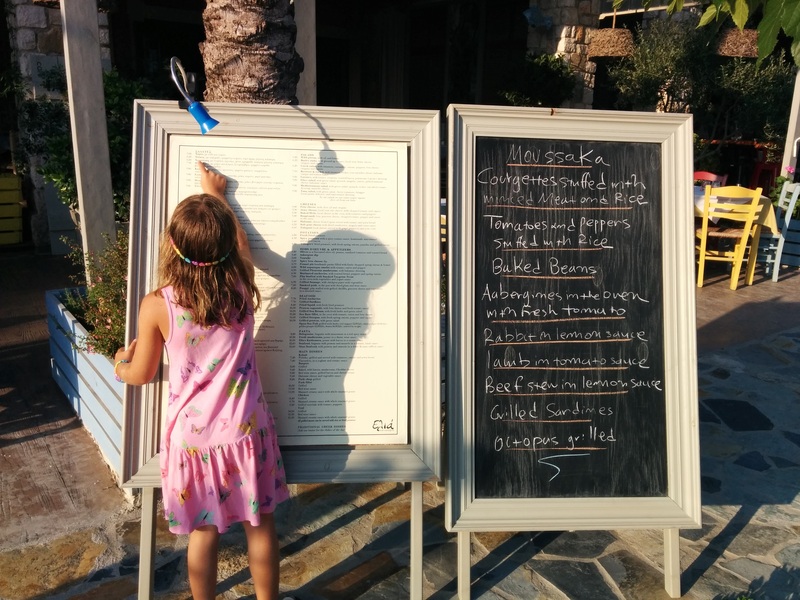 Owner Yiannis (father of two young children) made several recommendations for our kids. We choose the fried calamari, pastitio and a fresh fish called Skaros. Yiannis specially recommended the fried zucchini balls or kolokithokeftedes with tzatziki sauce, they were delicious. The best dish was the traditional moussaka. There were plenty of baby chairs in the restaurants and the bathroom facilities were brand new. Yiannis also recommends renting bikes with child seats and exploring the area by bice. Another one of his favorite family activities is horseback riding. 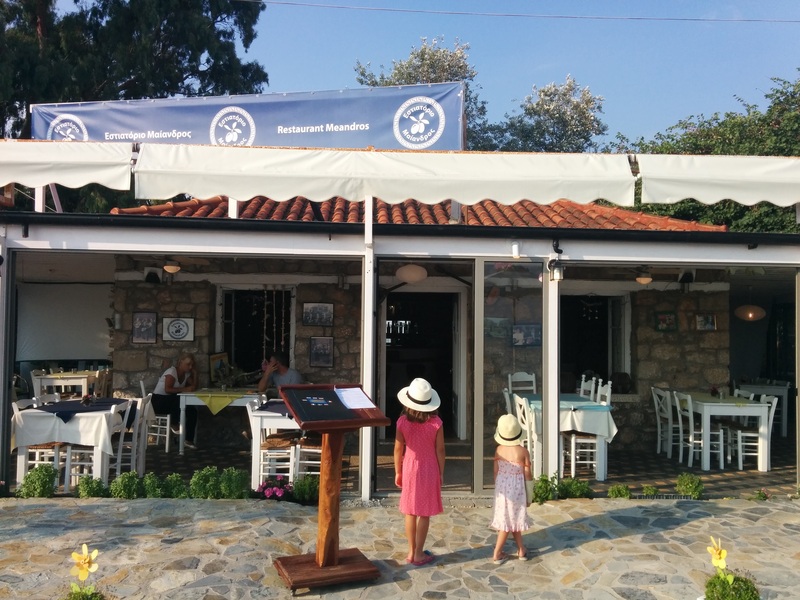 Meandros is the first restaurant on the boulevard owned by a Dutch lady living in Gialova for many years. 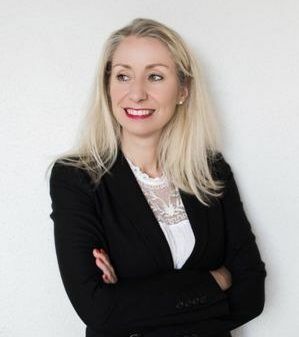 Her daughter Hanneke is the manager of Meandros restaurant. Hanneke is a beautiful warm hostess who speaks many languages, loves nature and dogs and has saved many stray animals in Gialova. She loves living in Gialova and is the mother of one son. Meandros serves traditional Greek food, their lamb is a favorite among the Greek and international customers. We tried several traditional starters or mezedes such as melitzanasalata and tzatziki. We also had calamari, meatballs with pasta and octopus. We especially loved the very refreshing Meandros salad with walnuts and cabbage. Meandros has many choices for children, even chicken nuggets. And Hanneke can make anything the children want to eat, even if it is not on the menu. Meandros is open all year and in the winter the restaurants attract a lot of people on Saturday evenings with live Greek music causing tourists to be dancing in the street! Hanneke recommends a visit to the nearby waterfalls and to discover the area by rental boat. Our family went to Gialova by car. The drive from Athens took us exactly 3 hours. The first 2 hours was a straight drive on the recently opened new Kalamata highway. The total cost of the tolls from Athens to Gialova was about 20 Euro for one way. The last part of the trip was a slow ride on a rural, sometimes curvy road passing through some beautiful villages and mountains. Here you can much fruit and veggie stands along the way. Oranges, enormous pumpkins, tomatoes and other fresh produce is here for sale and it is worth to make a stop. 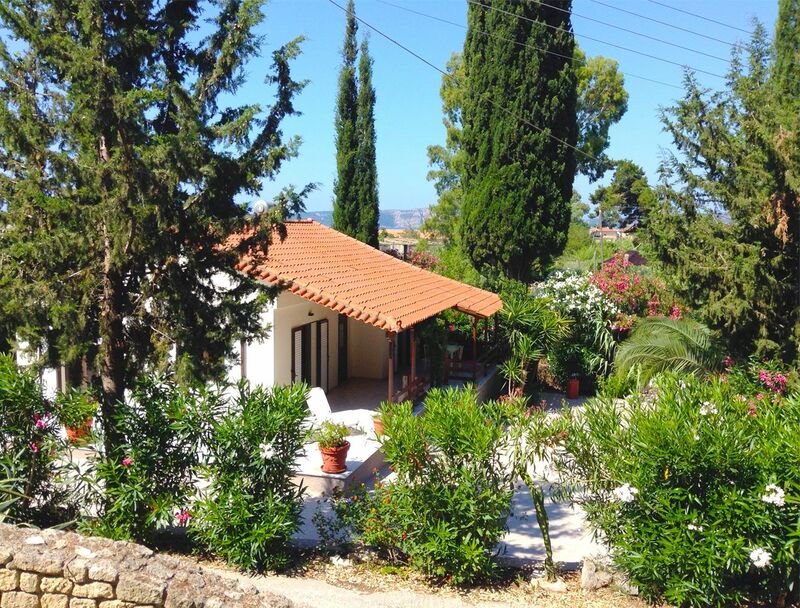 Gialova is 50 minutes away from Kalamata international airport. There is a public bus going to the Kalamata airport and from there is also a bus to Athens. We were invited by Gialova Gardens in Gialova. A family-friendly accommodation on walking distance from Gialova village and beach. My review can be found in Gialova Gardens family holiday bungalow and villa accomodation recommendation. 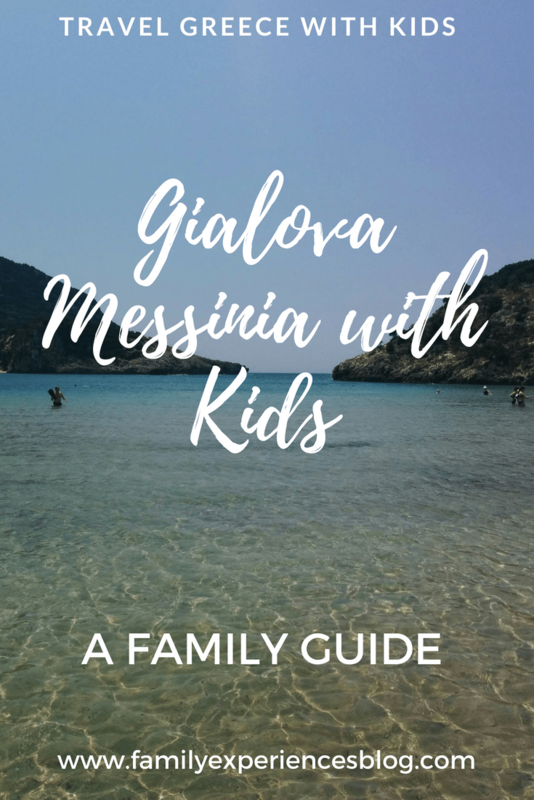 Have you been to the area of Gialova Messinia and what where your favorite outings with kids? Like this post, Pin it!